Founded in 2011 in Birmingham, England, Thirteen Shots comprised of Johnny Rose, Chelsea, George and Lewis Lew have been treating fans to their B Movie inspired garage rock 'n' roll sound ever since! They have released two albums which combine the likes of punk, psychobilly and retro garage rock to create their own unique sound and now they are back with their new single, 'First American Sweetheart' which is inspired by the romance of the silent film era and the star of the silver screen, Mary Pickford. The song itself has strong catchy rhythms driving it and is highly dynamic and energetic with well written lyrics to fit the cause! You can hear their various influences of genres; from punk shown through the instrumentation and the gravelly vocals presented with attitude and rock 'n' roll inspired riffs all packed into this anthemic tribute, which is all delivered well and makes for a tribute to be proud of! 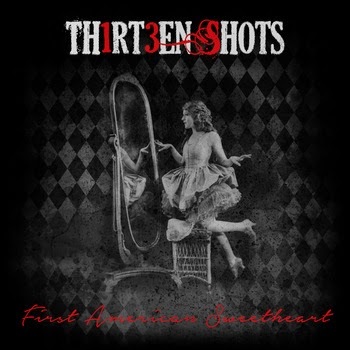 Thirteen Shots have created themselves an interesting sound which many should happily embrace and this new single highlights their talents brilliantly!